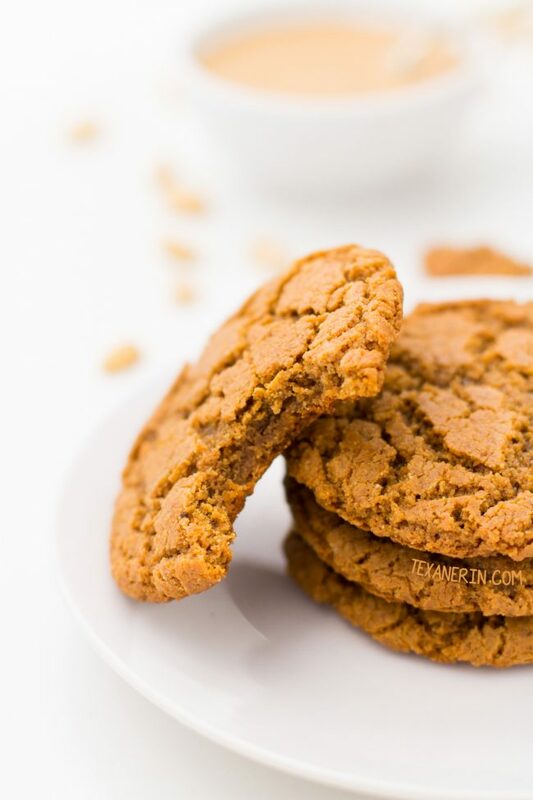 These gluten-free peanut butter cookies are flourless, super easy to make, and require just a few ingredients and minutes to make! They’re also naturally grain-free and dairy-free. Scroll to the bottom of the post for a how-to recipe video! You know those 3-ingredient peanut butter cookies that are so popular? The ones with just peanut butter, egg and sugar? I’m not a huge fan. I suppose the problem could be that I’m not using peanut butter like Skippy or Jif with added fat and sugar, but I’ve read people saying that you can use natural peanut butter in them, like in this recipe from Food Network, which specifically calls for natural peanut butter. I tried that recipe but I thought it wasn’t the best. Simple is nice, but with a few changes and a few extra ingredients, I think the cookies are hugely improved. So here we have my take on 3-ingredient peanut butter cookies! I’ve been playing around with perfecting the recipe for the last half year and people always ask for the recipe. So how do they taste? They’re the peanut butteriest peanut butter cookies I’ve ever had! And the texture is so perfect. Super chewy. These gluten-free and vegan peanut butter no-bake cookies are also awesome but they taste more like a mix of peanut butter and maple syrup. The original 3-ingredient peanut butter cookies recipe tastes so strongly of sugar (at least in my opinion!) so I reduced the amount of sweetener and used coconut sugar instead of granulated sugar, and added some vanilla and baking soda. 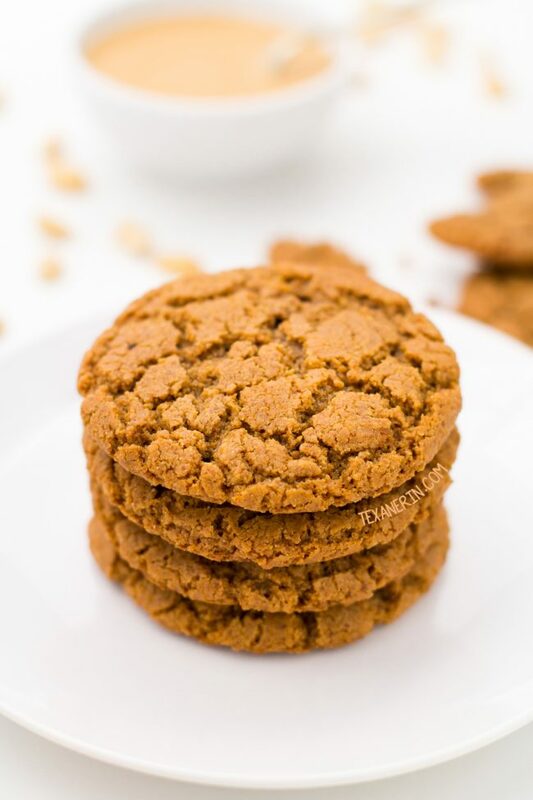 I’ve also made these cookies with brown sugar but everyone agreed that the slightly caramel-like taste from the coconut sugar added a lot of great flavor to the cookies! With regular brown sugar, they again tasted too much like sugar. I’ve tried these gluten-free peanut butter cookies loads of times with chia eggs to make a vegan version and the results were kind of funny. Or more like sad. I don’t recommend trying it. They were a disaster! I also tried these cookies with sunflower seed butter but they didn’t work out. Same with almond butter. Like I’ve said before, nut butters aren’t always interchangeable! Especially in a recipe like this where there are so few ingredients and every ingredient is important. If you’d prefer cookies with almond butter, try these almond butter chocolate chip cookies from Lauren Kelly Nutrition! They sound great. I tend to get the same questions asked over and over again (that I might add are answered in the post ;)) so I thought I’d put the answers all in one easy to read section! Do I have to use homemade peanut butter? I’ve made these cookies with homemade peanut butter made in a Blendtec and homemade peanut butter made in a food processor. I’ve also made them with two types of store-bought peanut butters (the only ingredients were salted and roasted peanuts). They all came out the same. BUT! Someone I know made these cookies (before I published this post) with store-bought peanut butter (the only ingredient was peanuts). She did everything correctly, but the dough was greasy and the cookies spread super flat and looked nothing like these pictures. She made them again with homemade peanut butter and they came out exactly as you see here. So the choice is yours. They’ll probably work with store-bought peanut butter, but I can’t guarantee it. If you DO make them with store-bought peanut butter, please leave a comment telling us how they came out! Update: Two commenters have used Kirkland (Costco’s brand) of natural peanut butter with success! Can I use another type of nut butter? I’ve tried these peanut butter cookies with almond butter and sunflower seed butter and they spread totally flat. I don’t recommend experimenting unless you’re prepared for failure. Can I make these cookies vegan? A chia egg does not work in these. That’s the only sub I’ve tried. Can I use another granulated sweetener other than what’s listed? I’ve made these with brown sugar instead of coconut sugar but the cookies then just tasted super sugary rather than peanut buttery. The coconut sugar adds a delicious, caramel-like flavor that’s perfect with the peanut butter! Can I use a liquid sweetener? That unfortunately won’t work. You need a granulated one unless you feel like reworking the recipe to accommodate the additional liquid you’re adding to the recipe. How do I make these low-carb? I’m sorry to say that I have no idea! I’ve never had a good experience with low-carb sweeteners. Preheat the oven to 350 °F (170 °C) and line a baking sheet with a piece of parchment paper. Position the oven rack to the lower third of the oven. In a medium mixing bowl, add all the ingredients. Use an electric mixer on low to combine it. At first it will be very thin but after about 30 seconds of mixing, it should be firm enough to roll into balls. The dough may or may not feel oily. Divide into 8 50-gram balls and place about 4" apart on the prepared cookie sheet. They spread a lot! Bake immediately (it seems as though letting them sit for a while affects how they bake up). Bake for 11-14 minutes or until they've crackled nicely and no longer appear wet in the middle (I needed 14 minutes but you may need less if you use a dark pan, make smaller cookies, etc.). Let them cool completely on the baking sheet (where they'll continue to bake). If you don't let them cool on the baking sheet, the bottoms of the cookies likely won't be baked enough. 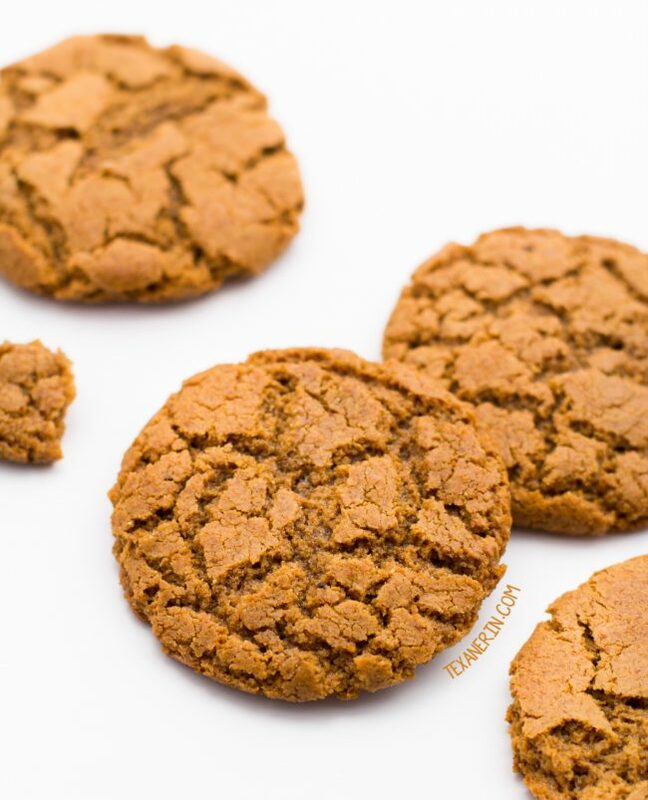 41 comments on “Gluten-free Peanut Butter Cookies” — Add one! I’ve made these cookies about a dozen times, and they are so great. I just texted the recipe to a new neighbor who I made them for and wants to make them. I add chocolate chips and dried cherries. I also scoop the batter with an ice cream scoop instead of rolling. Thank you for a truly amazing recipe! You’re welcome! I’m so glad that you enjoyed them. :) Chocolate and dried cherries sounds delicious. Yum! Thanks for your feedback and sorry for my slow reply. 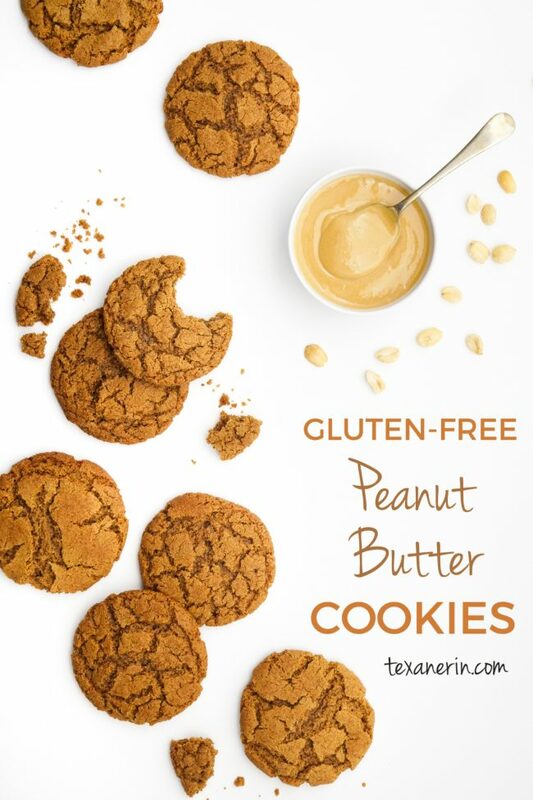 I looked at several GF peanut butter cookie recipes before deciding to try this one…and I’m so happy I did! The cookies are delicious; crispy on the outside, a little chewy on the inside! My dad, who does not follow a GF diet, said these cookies are the best peanut butter cookies he’s ever tasted. This recipe will definitely be saved for many future bakes in our household! Thank you! You’re welcome for the recipe! I’m so glad that you decided on this recipe and that they weren’t a disappointment. And wow, what a compliment from your dad! That made my day. :) Thanks for your comment and sorry for my slow reply! I used a British store bought natural peanut butter (brand Biona) and they came out fantastic! I don’t usually mess around with recipes on the first try but this recipe is really customisable – it’s hard to go wrong with it! So I did mess around a bit but the cookies came out perfect anyway. Also super easy to make, I just dumped everything in a bowl and mixed it up with a fork. Didn’t mix up the peanut butter perfectly so I could have bursts of extra strong peanut butter flavour in my cookies. Slight crisp on the outside, chewy on the inside, and very peanut buttery! Love it! Thank you for this! Thanks for the tip on the brand of peanut butter you used! I’m sure that’ll help the British readers. :) And I’m so happy that you enjoyed them! I love the idea of having peanut butter bursts in there. Thanks for your feedback! I keep my natural peanut butter in the fridge and when I used it in this recipe, the cookies didn’t spread enough – just puffed up like little domes. If you use cold PB, I think it would be smart to press the dough ball down a hit before baking – or just make sure it’s room temp. Aside from my user error, they are delicious! Thank you for all the great recipes!! Thanks for the tip! I keep my homemade peanut butter in the fridge and they spread like you see in the pictures, but my peanut butter is pretty runny (like in the video). I guess it has to do with the exact peanut butter used. I’m happy that they still came out delicious. :) You’re welcome and thank you for your feedback! Smuckers natural peanut butter worked well! Baking soda is definitely gluten-free. Just make sure it doesn’t say something like, “Could contain traces of wheat” or something, which happens if it’s manufactured in a factory where they deal with wheat. Just made these, and they are SO amazing. You cannot tell at all that they are dairy and gluten-free. I added chocolate chips (because, why not! ), and next time I want to add dried cherries. Amazing recipe! Yay! So happy you liked them. And good call with the chocolate chips. :) That’s always a good addition. Thanks for your comment! 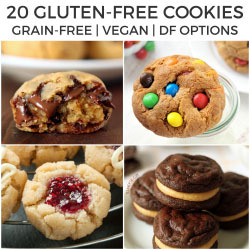 The cookies look so full of life, I wish I could take a bite!”The fact that it is gluten free yet made of peanut butter which makes it even unresistable! Thank you for sharing such an amazing recipe! Hi, do you think I can replace the coconut sugar with 1/2cup honey and 1/2cup xylitol? Has anyone tried this yet? Please check out the substitutions section if you haven’t already. :) Short answer is – I don’t know. Sorry about that! thoughts on how these might taste with sunbutter instead of peanut butter? My kiddos are nut free. I just made these and they’re delicious! I used 1/2 cup of honey instead of coconut sugar, added an extra egg, then chilled the batter before scooping it out. They turned out so light and fluffy!! Ours are in the oven now! The cookie dough was DELICIOUS! But we used 1/2c Swerve sweetener and 1/4c coconut sugar and they aren’t spreading at ALL. I had to flatten them with a fork. When I did that I found that they very crumbly. I’m guessing this is from not using all coconut sugar? These are really good! Making them for the second time tonight! Those look like total perfection, I can’t wait to try these! Thank you for the recipe, loved it! I doubled the batch and hand mixed it. I used Kirkland (Costco) peanut butter and it wasn’t too runny, but it was unsalted so I used a teaspoon of salt for my double batch. Slightly burnt the first ones in the oven as cook time was shorter than 14 mins. Will make these again! I used Costco peanut butter also and dumped out the oil (which sits on top) after opening a new jar; I wanted a thicker peanut butter. They turned out amazing! 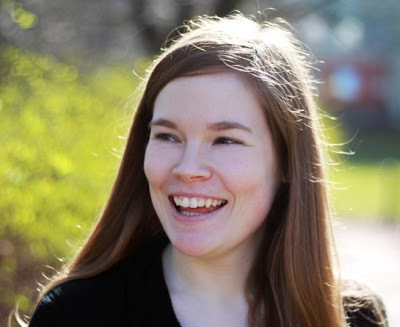 Erin replies to Kari H.
You’re welcome! It’s great to hear from another person that Kirkland peanut butter works well. I’ve updated the post to let people know that they can also use that. Thanks so much for the tip and for your comment. :) I’m happy you enjoyed them! I could eat a dozen of these cookies! So delicious! Thanks for sharing this recipe. It is hard to find good gluten-free desserts! This needs to happen soon! Yummy! Making these cookies seems to be so easy! I am sure they are so tasty, too! Peanut Butter Cookies bring back such childhood memories. My peanut butter-loving daughter would go crazy for these!